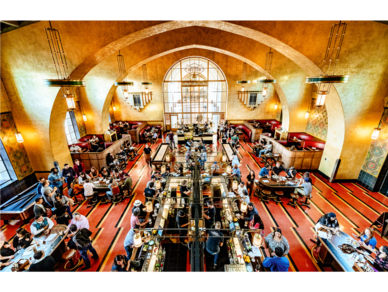 Named after the legendary Southern Pacific train of the 1930's, Imperial Western Brewing Co marks a new era of imbibing and dining for commuters at Union Station. Enjoy a wide selection of craft beer brewed in-house with an extensive menu program. In true beer hall fashion, the space also features custom game tables, pool tables, and shuffleboard.